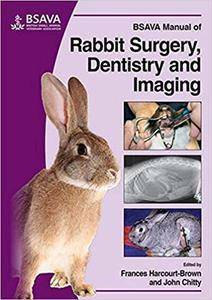 Rabbits make up a considerable proportion of the caseload in small animal practice, and knowledge of rabbit medicine and surgery has grown rapidly in the past decade such that one BSAVA Manual is no longer enough to do justice to this important pet. The all-new BSAVA Manual of Rabbit Surgery, Dentistry and Imaging concentrates on the major surgical and dental conditions that are so common in rabbits, while its sister volume (BSAVA Manual of Rabbit Medicine) concentrates on common medical conditions. To maximize surgical success, anaesthesia and analgesia are first discussed, including practical advice on different regimes for different situations/risk levels, chemical pain relief and also hospitalization and postoperative care. A section on imaging follows, covering not only radiographic techniques and their interpretation, but also ultrasonography, endoscopy, CT and MRI. The third part of the Manual is devoted to surgical techniques. General principles of rabbit surgery are discussed, as well as specific surgical techniques and procedures, from basic techniques such as neutering to more specialized techniques used in each organ system. The final section is devoted to dental disease and abscessation, including the techniques required for a full dental examination and evaluation. The range of treatment techniques available for cheek tooth overgrowth and dental abscesses is highlighted, and the reader is encouraged to draw their own conclusions as to the correct method to use in each case. Illustrated step-by-step Operative Techniques are provided for surgical and dental procedures, to enable the reader to benefit from the expertise of the international authors. Frances graduated from Liverpool University in 1973 and set up asmall animal practice in 1977 with her husband Nigel. Frances isthe only person to receive the BVA’s William Hunting awardtwice: first for ‘A review of clinical conditions in petrabbits associated with their teeth’ (VeterinaryRecord, 1995); and secondly for ‘Gastric dilation andintestinal obstruction in 76 rabbits’ (2007). She has sincepublished many other papers and received many other awards,including the BSAVA’s Melton and Dunkin awards.Frances’ renowned Textbook of Rabbit Medicine (2001)gained her a worldwide reputation. She became an FRCVS with herthesis on dental disease in pet rabbits and is a de factoDiplomate of the European College of Zoological Medicine and theonly RCVS Recognized Specialist in Rabbit Medicine and Surgery. Shestill works in general practice, with pet rabbits forming 95% ofher caseload. John qualified from the Royal Veterinary College in 1990 andgained the RCVS Certificate in Zoological Medicine in 2000. He iscurrently the Director of a small animal/exotics practice inAndover, Hampshire, with a 100% avian/exotics/small mammal caseload(both referral and first-opinion). John is co-editor of two textson avian medicine and author of various book chapters and papers ona range of species. He is Secretary of the European Association ofAvian Veterinarians and Journal co-editor and board member of theAssociation of Exotic Mammal Veterinarians.